This week Rhythmic Magnolia and Spiritual River received custom tokens made by one of our field therapists. In addition, Enlightened Lotus received the “Awakening” token during his parent visit. The students hiked very well, pushing almost two miles at a time. Towards the end of the week, the Pindari merged with another group, The Dingos. Also this week one of the Pindaris was invited to go on a Boomerang Expedition to explore more about himself and dig deeper into his heritage/identity. 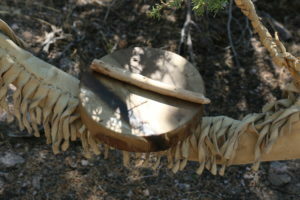 Throughout this expedition, he crafted a dreamcatcher, a rawhide drum, a digeridoo, and a small clay flute and was able to explore the cultural origins of each. The Boomerang experience also entailed a challenging peak hike through Keg Pass and the surrounding mountain range and left this Pindari feeling comfortable with being emotionally open when prompted. In addition, in celebration of his progress and journey during his time at Outback he was honored with the Maker and Hewed Stone tokens. Finally, during the last few days of his expedition he encountered a pack of wild horses and felt that their energy, this experience was powerful, inviting, and impactful. Resilient Phoenix got a new token, Making Amends, after her parent visit. She has come a long way in her relationship with her father and this was recognized by the group. Another Keet got her trail name, Sparkling Cascade. Many games were played as well this week, Salad Bowl was a favorite in which students play multiple rounds of charades. 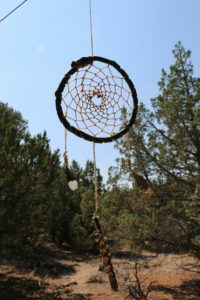 This week the group made dream catchers, watched the stars every night, and merged with another group, the Pindari. The group merge went incredibly well and all of the boys from both groups are becoming great friends already. Fiery Ant received the Brightness token, and Contemplative Shaman received the Giver token. We played lots of games, sang lots of songs, and had a wonderful week out in the desert.